Duff Muttu is an art form prevalent among Muslims in Kerala state of south India using the traditional duff, or daf, also called Thappitta. Participants dance to the rhythm as they beat the duff. The tradition method of playing this is by standing in a u shape, then singing byth i.e. the traditional Arabic song and then playing according to the song, and the modern way is by singing any Islamic song and then adding steps according to the song, then playing the duff. The method is similar but slightly different to that performed in Saudi Arabia and in almost all of Gulf Arab countries.The Duff Muttu is said to have been initially performed in Madina in South Arabia. This used to be performed on the paddy fields of Arabia where the artists used to sing the praise of the Lord. 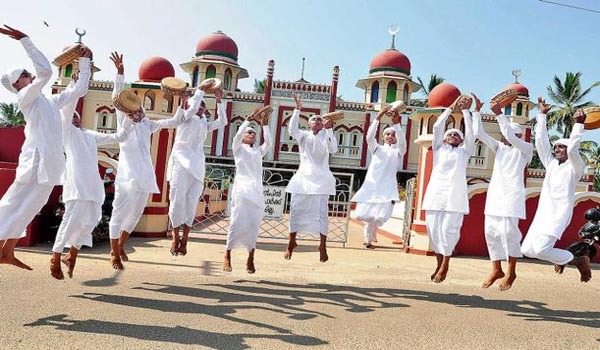 The Mapilla Muslims of the state of Kerala, perform the Duff Muttu. Duff Muttu, the art form, is quite famous among the Muslims of Kasargod & Malappuram districts in the Malabar Region of Kerala. Mosques and Madrasas have their own Duff Muttu troupes. Stage competitions are also arranged all over Kerala. The songs often have a tribute to the martyrs, saints and heroes as their central theme. Often the songs are in Arabic and sing the Creator’s praise. The Duff (Dubh) is a musical percussion instrument made of wood and ox skin. It is also known as the Thappitta. Sometimes the Aravana is used instead of the Duff. Hence the art is sometimes called the Aravana Muttu or Aravana Kalli.